Tele Vue President David Nagler grinning ear-to-ear over the Apollo 11 eyepiece. A package arrived at Tele Vue’s door on the Monday before the 2019 Northeast Astronomy Forum (NEAF). It was quickly ushered into the corner office where a small group gathered around the parcel. When opened, three black boxes were withdrawn. For the first time, after many months of development in secret, each black box was opened by a member of the design team. At Tele Vue, we call these internal product reveals a “magic moment” — when fresh prototypes are unboxed in the office for “first light.” This was a “magic moment” unlike any other; one 50-years in the making. 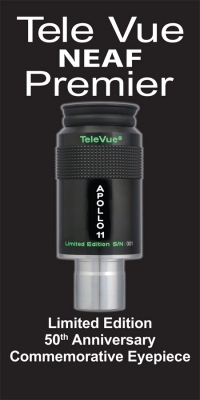 The Apollo 11mm commemorative eyepiece had landed! 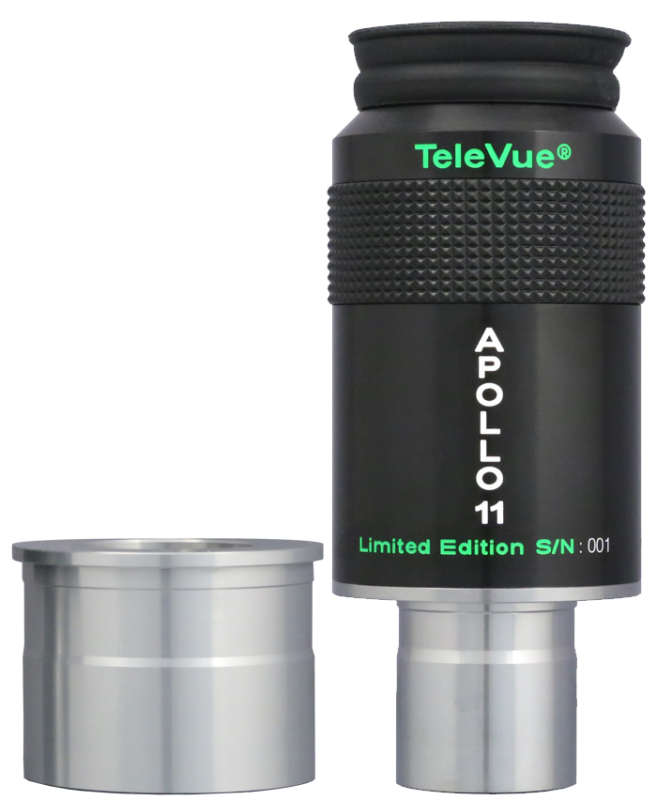 Apollo 11mm eyepiece with included 2″ adapter. While the Lunar landing of Apollo 11 inspired generations of people in countless ways, a unique experience in the development phase of the Apollo program inspired one man on a journey which would eventually change amateur astronomers’ views of the heavens. As an optical designer at Farrand Optical Company, Tele Vue founder Al Nagler was tasked to design an optical system for a simulator which the Apollo astronauts would use to practice landing on the Moon. When he finally stepped into the Lunar Excursion Module (LEM) trainer to see how his optical system performed, the view out of the craft’s iconic triangular window of the simulated Moon below and stars above was breath-taking. Little did he realize at the time, but that was the moment of inspiration that ultimately resulted in the “Nagler” eyepiece. 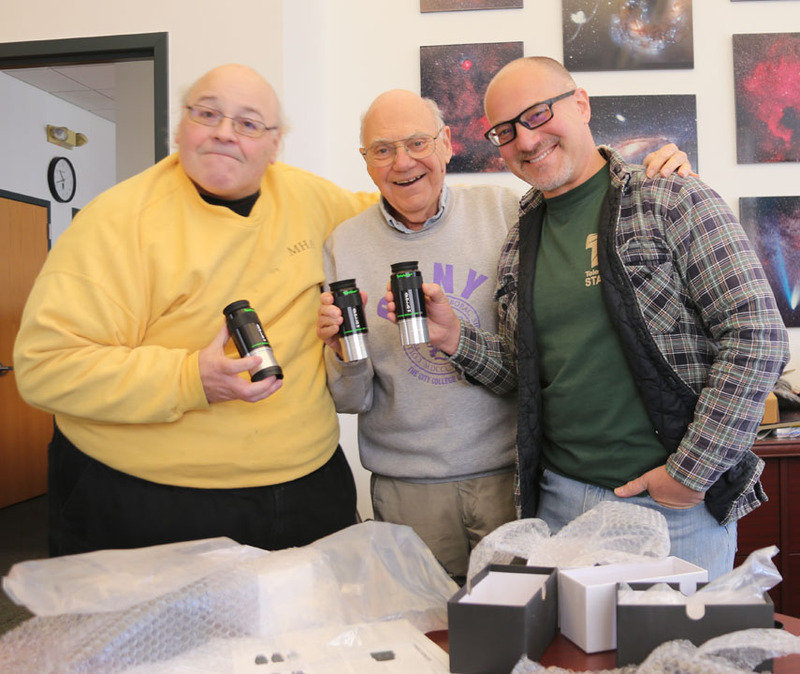 Apollo 11mm eyepiece “Magic Moment” at Tele Vue headquarters with the development team (left-right): Paul Dellechiaie, Al Nagler, and David Nagler. In recognition of the 50th anniversary of the Apollo 11 Moon landing, Tele Vue is proud to celebrate our founder’s contribution to the greater effort that made the mission possible and ultimately successful. 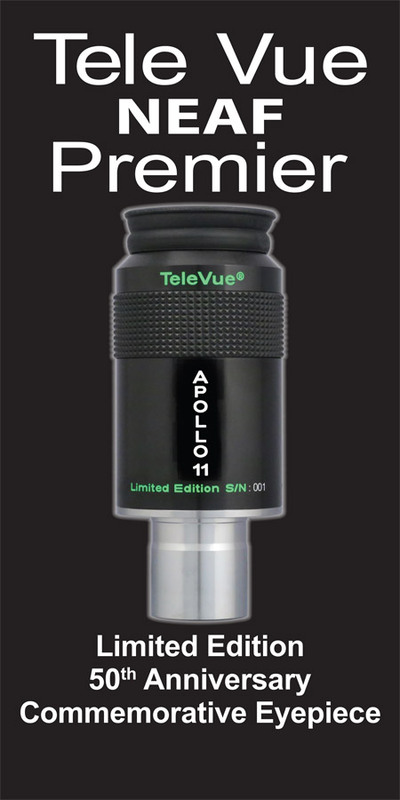 The special, limited edition commemorative Tele Vue Apollo 11mm eyepiece pays tribute to the simulator program that was invaluable to astronaut training and to the direct influence it had on the eyepieces we enjoy today. 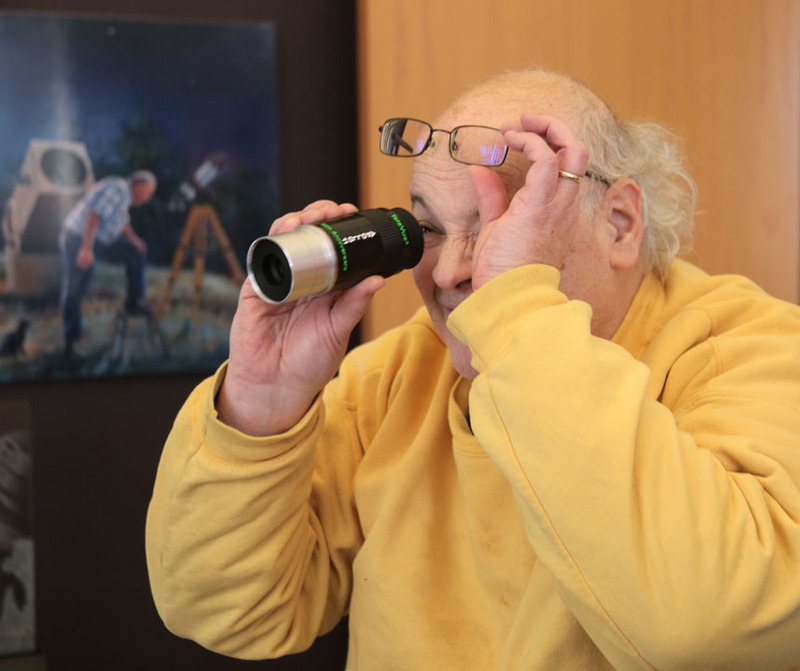 Paul examining the apparent field circle of the Apollo 11mm eyepiece. Quickie Apollo 11mm banner for NEAF show. 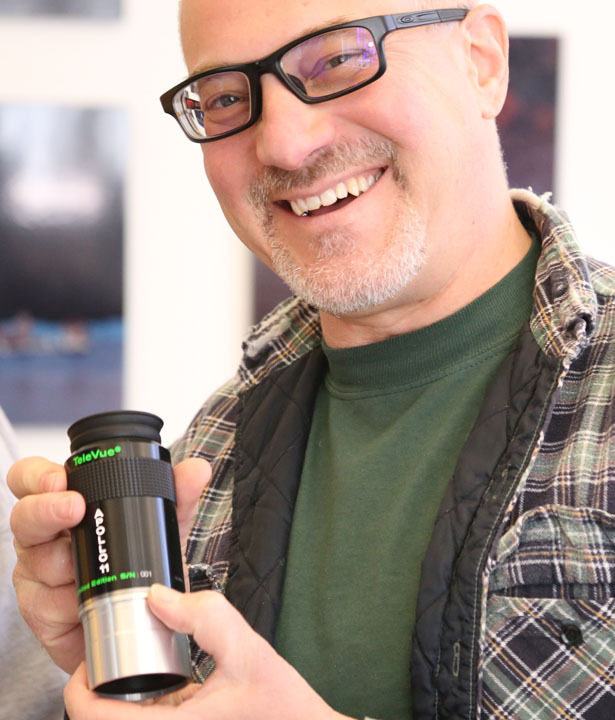 NEAF was only 5-days away and we knew the world’s largest Telescope / Space show, whose theme was the celebration of the 50th anniversary of the landing, would be the perfect place to premier the eyepiece. So we quickly photographed an Apollo 11mm prototype to create a show banner and put together a handout to inform the public. Amateur astronomers at the show were thrilled to touch and look through the Apollo 11mm. Their comments on the eyepiece typically included these questions which we answered: When will it go on sale? 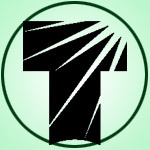 How can I get on a wait list? What will it cost? Is this a new “line” of eyepieces? Answers: sometime this Fall, there is no central list; it will be sold through our regular dealer network; Price has yet to be determined; the Apollo 11mm will be a one-off, limited production, commemorative eyepiece. Stay tuned to this blog for updates on the Apollo 11mm eyepiece. History of the Nagler eyepiece and the Lunar Module Simulator can be found in: The Eyepiece That Changed Observing (Astronomy, Dec. 2005). Prior blog posts on Al Nagler’s Lunar Module simulator work include: 2019 Anniversaries (simulator and Tele Vue eyepiece spinoff) and Al’s First “Space Walk Experience” (simulator restoration). Previous Previous post: Tele Vue at NEAIC!